RedSavant wrote: Any chance of having the artbook released in the US, by the way? I'm sure a bunch of American fans would buy it. the devs have said they don't want money involved, and with the team scattered across the world, that really makes sense. especially if people who worked on the game and then left try to get a piece of the pie. I just hope we get scans of the art book at some point. Fhegy wrote: Eheheeee~ Well reading stuff like this makes me more sure of my previous statement, give Katawa Shoujo a few years more and it will become a big hit animé/manga! Bad I know, but you get the idea, right? That would be fun it would be. I thinkwe once had a thread about who we would want as the Seiyuu for each of the charecters. I think Hir answered your question in the very blog-post you're replying to. hir wrote: We are aware that there are lots of requests for distributing the scanned data and all. We are seeking the possibility to fulfill these needs in one way or another. We appreciate if you can give some time for this. griffon8 wrote: It's not that I don't like Rin; I just don't like her quite as much as the rest. And I like her the best! I think she's a bit of a kuudere, aloof and distant on the outside (+strangeness), playful and vulnerable on the inside (+strangeness). I went to Comiket on the wrong day wahh. Glad to hear it was so successful though! Remmeth wrote: I'm glad Japan's really into this. 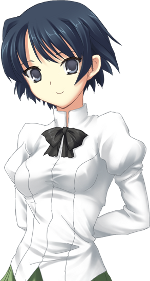 Part of Katawa Shoujo is something a like a parody of those japenese highschool anime/games/etc. Even the country that's being parodied can appreciate it if it's made with love and thought. That's how it was for the Mother series, and that's how it is for this. If by parody you mean love letter, since it really doesn't poke fun at it at all, sure. whiteflags wrote: If by parody you mean love letter, since it really doesn't poke fun at it at all, sure. Indeed, another word that would have worked there is 'emulated'.